With Washington state’s Clean Energy Initiative 937 (one of the NW Energy Coalition’s major policy achievements) investments in energy efficiency in Washington are at an all time high. Coupled with ARRA funds, more homes have more access to more energy assessments and retrofits. 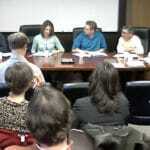 The Coalition convened this panel of experts to update us on their energy efficiency programs. What’s working? What motivates people to be interested in energy efficiency? What are the barriers to investing in efficiency retrofits? How does alternative financing play a role? Hear from panelists on these and many other topics. Interested in joining us for future information sessions at our Seattle office? Contact us at nwec@nwenergy.org for more info!